Now in the internet age, applying for HVAC jobs has never been easier. You see an ad, email your resume, maybe write a cover letter, and you’re on your way. That said, getting noticed has never been harder. You are competing in a sea of applicants that might have the exact same experience as you. How do you make your resume stand out from the crowd? This article will give you the tips you need to create an exceptional HVAC resume, one that will really highlight your strengths and experience level for prospective employers. 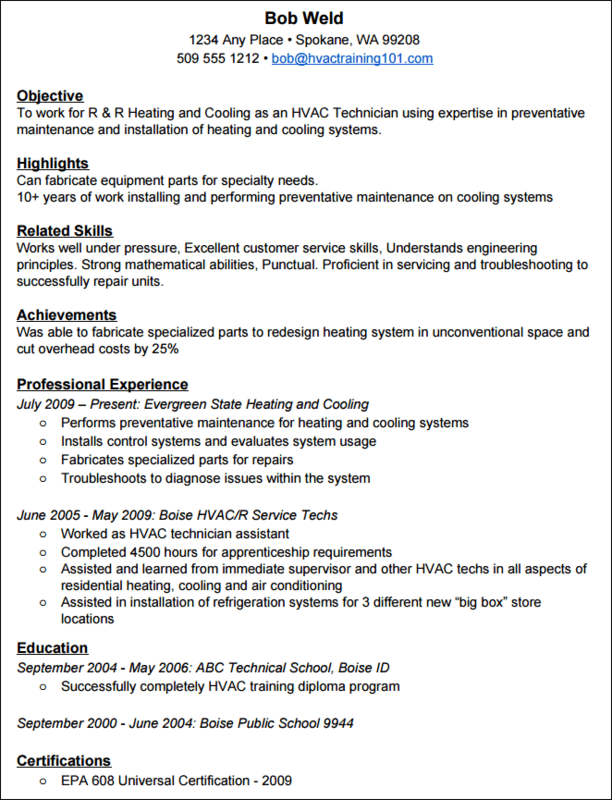 A good HVAC resume should tell a story to employers. It should include all of your training, skills, experience, and career goals. Present your work history and skill set in a neat and organized fashion. It is important not to over explain or clutter up the page, making it difficult for employers to read. You should be thorough, but concise. Simple is better when it comes to resumes. The top of your resume should always include your first and last name, permanent address, phone number, and email address. Create an objective that is tailored to fit the position and company you are applying for. This section answers the question of ‘why’? Why are you applying for this particular position and this specific company? To work for R & R Heating and Cooling as an HVAC Technician using expertise in preventative maintenance and installation of heating and cooling systems. Proficient in servicing and troubleshooting to successfully repair units. You can list your career highlights at the top of your resume. If you have a lot of standout accomplishments in the field, this is your chance to put them right where an employer will see them. This is the section where you can talk about the more unique aspects you possess as an HVAC technician that might not fit under other sections. Can fabricate equipment parts for specialty needs. 10+ years of work installing and performing preventative maintenance on cooling systems. List all of the related skills you have in the field. This part should include technical skills, but it should additionally let employers outline the personal attributes you possess that make you an excellent candidate. If you have examples of on-the-job victories, the achievement section is a great place to get specific. This will add detail your career narrative and allow employers to really understand who you are as a technician. Was able to fabricate specialized parts to redesign heating system in unconventional space and cut overhead costs by 25%. This section is where you list your related work history. You should list what companies you worked for, how long you worked there, the title you held, and your job responsibilities. Remember, you should list your responsibilities in the present tense for the position you currently hold and all prior job responsibilities should be written in the past tense. This part is easy. Just list your educational institutions, the type of diploma you received, and the dates you attended. While HVAC is technical, hands on work, you still need to offer good customer service. Companies want someone personable to interact with their clientele. If you have ever worked in the service industry, even if you were just a pizza delivery boy, some customer service experience is better than none! Having certifications on your resume shows that you care about continuing your education within the field. Getting certified will open the door for new opportunities and responsibilities. For more information about getting your HVAC certification you can learn more here. While you might have the repair skills, being able to diagnose issues and troubleshoot your way through a difficult job. Employers really like having a technician who possesses great diagnostic skills. Delivering it in person to the company will make you stand out. This helps prevent your stellar resume from getting lost in the shuffle. It will bring your resume to life, putting a face to what would otherwise be an anonymous piece of paper. Try to get in touch with the HVAC community in your area. Don’t zero in on companies only – building meaningful relationships with their current employees could be equally valuable to securing a position. Real life connections get jobs. Talk to local contractors in your area during the busy season to get hands-on experience. HVAC work can be seasonal, it tends to pick up in the spring and summer. Get a referral letter from your instructor if you went to school for HVAC, but lack experience. A good word from a trusted HVAC technician can go a long way. If you are looking to break into the HVAC field without any experience, here are some ways to get a leg up on the competition. Take a NATE ready-to-work test and get your entry-level certification. This will show that while you might not have experience under your belt, you are willing to go the extra mile. It is an online, unproctored exam for those without any hands-on experience. Going for an EPA certification is another great option. Whatever route you think is best, getting a certification will be a huge help when applying for a job. Make connections and network at your local union. With an apprenticeship, once you register you will be able to interview with contractors that use labor from your union. You can even work as a tradesman through the union, which will give you hands-on experience. You might not become a helper or get an apprenticeship. Starting off as a parts runner, coil cleaner, or filter changer is a great way to get your feet wet. Applying for maintenance positions for a smaller company can also help you get experience while making industry connections. Your objective on your resume should highlight your relevant skills and training. It should also be tailored to the specific position you are applying for. Also remember you should include that you are looking to gain experience and learn. Diligent HVAC student with strong understanding of technical and mathematical concepts seeking HVAC apprenticeship with ____ company. HVAC is skilled and very necessary work. There is an existing demand for experienced HVAC technicians. Building a good resume is key to advancing in your HVAC career. Being able to present your unique skill set, education, and experience will make all the difference while job hunting. Just as important as creating the perfect resume is knowing who to circulate it to. Be sure to reach out to your local unions, companies, and fellow technicians.